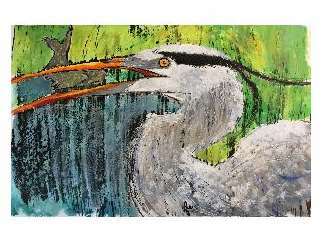 Beginning March 4, and continuing until the end of May, the Atascadero Library will host an exhibit that features the work of local poets and the engaging art of Jeri Edwards. Edwards is a lover of nature and wildlife who advocates for wildlife conservation and education. She uses a variety of media, including collage and gouache and ink resist, and is a published poet as well. Our connections with animals will also be explored by local poets whose work is on display. All are invited to meet Jeri Edwards and many other local poets at a reception at 5 p.m. on Thursday, March 7. Light refreshments will be served.